What factors do you need to consider when shipping to China from the USA? Due to the differences in the two countries’ political systems, shipping to China from the US can be challenging and confusing since China’s regulatory processes are controlled and dictated by a single-party governing body. New tariffs (especially retaliatory tariffs), customs regulations and other import related processes and regulations may be authorized and enacted with very little or even no grace period. The Chinese government imposes tight restrictions on commodities such as personal effects, secondhand vehicles, liquor, tobacco, waste paper, dangerous goods, metal scrap, returned merchandise, etc. It is strongly recommended that you consult dependable transportation professionals at the origin and that they work with their counterparts in China to ensure every required document for imports into China are in place before the goods being shipped are en route. This will avoid consequences such as fines, delay of released goods, cargo abandonment and related costs. China Customs even has to right to confiscate your goods upon arrival at the destination. Disputes on customs classification in China can be costly, lengthy and sometimes arbitrary while cargo is being held in China Customs. Appealing arbitrary customs decisions in China can prove to be difficult as the government grants relatively limited due process rights. Should you need advice or consultation, the professionals at DGX - Dependable Global Express stand ready to help. We have the experience, knowledge and reliability to ship your goods to China as smoothly and safely as can be done. We offer a unique package of shipping services including cargo shipment by air or ocean, logistics, oversize/project cargo, hazardous materials, to the job site, door-to-door, Final Mile/Last Mile, White Glove, after hours/weekends and trade shows/conventions. Give us a call today at 800.488.4888 and we’ll help answer questions and get you a rate quote! What are air shipping freight rules to Australia? All shipments with solid wood packaging materials such as pallets, crates, shipping materials, dunnage, etc., must be properly stamped with ISPM 15 compliance markings. Be sure the international freight forwarder you select has the expertise to make sure your shipment complies to all Australian shipping nuances. Air shipping will move your cargo in hours vs. days, weeks, or even months compared to ocean shipping. Almost all major airlines today utilize modern, efficient aircraft fleets to carry passengers and air cargo over long hauls around the globe, with Australia being one of those key long-haul destinations. Air shipping is also more likely to be on time due to air freight's networks and daily flight schedules. Another benefit – unlike the perils of sea freight shipping, shipping by air is one of the safest modes of transportation today. You will be happy to know air shipping to Australia is really quite simple. DGX - Dependable Global Express is an experienced, customer-service focused international freight forwarder that will responsibility to engage in navigating all aspects of the shipping rules. If you consider us, all of your freight forwarding and logistics details will be covered. Contact us today or get a free online rate quote here. DGX - Dependable Hawaiian Express creates superb value by offering excellent shipping, to and from Costa Rica, at competitive pricing. For the past 10 years, DGX, in conjunction with its Costa Rican partner, Transportes Mundiales Bensa, has been offering weekly direct service from Los Angeles to San Jose, via Puerto Caldera, Costa Rica. With our company service provider goals of reducing freight charges and transit times from the West Coast of the USA to Costa Rica, our direct service from Los Angeles separates DGX from any other freight forwarder in the Costa Rican market. It’s the special combination of the direct route and fast transit times. West Coast cargo can more easily move to Los Angeles as opposed to routing via Florida which is expensive and cumbersome. Additionally, trucking companies have been increasing their overland rates lately due to fuel surcharges (coupled with decreased service levels due to weather issues and driver shortages), and Aeromexico has stopped its direct weekly freighter from LA to SJO. Lastly, a rise in ocean rates from Miami to Costa Rica. Given this set of issues, customers can better control their costs by taking advantage of our West Coast-to-Costa Rica service. Recently, we changed our Costa Rica service for the better and can deliver your goods in 10 days as opposed to 17. A major advantage to our service! Most importantly, DGX sailings cut off on Fridays and sail on Wednesdays, as opposed to other providers that service this destination via Miami. We will continue making a major difference to all customers shipping from the West Coast by providing options that simply make more sense with great rates and fast transit times. DGX is committed to our customers shipping to and from Costa Rica. We're creating superb value by offering excellent service at affordable rates. What is an acceptable transit time for shipping from the U.S.A. to Guam? There are two carriers that currently provide ocean service from the U.S.A. to Guam. One carrier has a transit time of two weeks with an arrival of Tuesday every week. The other carrier has a transit time of three weeks with an arrival of Thursday or Friday. At DGX - Dependable Global Express, we pride ourselves in moving product for businesses as fast and problem free as possible. Thus we choose the quicker carrier to Guam – the one with the better on-time record. Our carrier has an on-time record of 78%, based on an ETA of 59 minutes or less. The alternate carrier has an on-time record of only 23%, less than one in four of their ships are on time. DGX also offers the latest cut-off times in the industry to receive freight on the west coast, as well as we offer deliveries in Guam within 48 hours of container availability. This gives you a total transit time from the west coast of 17-18 days. The other carrier would provide a 30-day service from the west coast to Guam, due to earlier carrier cut offs and transshipment through a foreign port. Check out our ocean sailing schedule. Your product availability is delayed meaning you’ll need to keep more inventory in stock. This costs your business more money. Vendor payments are due just as product is being delivered on Guam, based on net 30 day terms. Business competitors may receive their product earlier and are able to deliver and complete the sale sooner—thus you lose the sale. Not having your product before the weekend can affect your total weekend sales. Last minute orders can make the same week sailing and arrive in 17-18 days. Less inventory needed increases profitability. Having inventory on hand to sell before payments are due to vendors. More sales and better customer loyalty because you always have inventory in stock. With slower transportation and lower transportation costs, is it worth the added expense of higher inventory levels and the risk of losing customers and sales waiting for product to arrive? Call DGX today for a rate and sailing time quote to see how we can save you both time and money. To facilitate the shipping of your freight to or from New Zealand, as one of the Dependable Supply Chain Services, DGX - Dependable Global Express provides a wide range of forwarding services. With an established DGX-owned and operated office in Auckland, New Zealand along with an exclusive partnership in Christchurch, NZ we offer the most reliable and cost effective solutions to all your shipping needs. Our web-based tracking capability provides visibility and peace of mind to all of our shipping and logistics customers. You may view the status of goods, orders and shipments easily and in real time. Promptly access information whenever needed! DGX prides itself on weekly consolidated service from all origins within the continental USA to any destination within New Zealand and the Pacific Islands. With dedicated specialized customer service representatives at both origin and destination, we can assist you with any type of move whether it be LCL, FCL, air or a special project cargo need. Contact our local DGX New Zealand office today! DGX simplifies the ocean or air shipping process for you. As an international freight forwarder, we offer full logistics services to and from the Philippines as well as comprehensive supply chain solutions. And we’ve done so for thousands of international business partners. Our international freight forwarder services extend to ocean and air freight, customs clearance haulage, and project cargo handling and management. Our partnership with top-tier air and sea carriers provides competitive rates, flight or vessel schedules, booking flexibility as added value to our customers. We ensure the integrity of the shipment is maintained, taking all necessary steps to deliver the goods complete, intact and more importantly, on time. Visit DGX’s Philippines' office page and request a rate quote via telephone, fax, email or use our convenient online rate quoter. Within 24 hours, you will receive your competitive rate quote. If rate is acceptable, sign the contract and the booking of your freight shipment will be coordinated at DGX. We’ll help instruct as to how to provide to us and conveniently, provide your shipment status for tracking and monitoring. Upon successful completion of cargo shipment, we’ll send your Proof of Delivery and invoice you. Visit us today for all your Philippines freight shipping needs. How do I ensure safe sailing to Guam? There are 6,000 miles of ocean to cross for your cargo to arrive in Guam – the equivalent of going from Los Angeles to New York and back again. The ocean is not a smooth paved highway, but rather comprised of vast, turbulent seas with swells as big as four-story buildings through which sea faring vessels need to navigate. The vessels get knocked around quite a bit, causing cargo loaded inside containers to shift and move during transit. In order to minimize any damage caused by the often rough trip, the shipping professionals at DGX - Dependable Global Express always take extra care when loading your freight by adding dunnage and cardboard inside the containers to safely secure the loads from shifting and moving about inside your containers. Always load heavier items on the bottom of pallet, with lighter product on top. 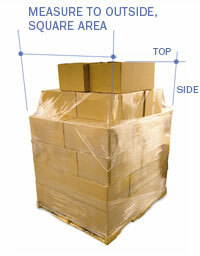 Use three to four layers of shrink wrap to help keep the load from falling off the pallet. If your boxes are soft cardboard, use corner protectors before wrapping, so boxes are not crushed when wrapping. Minimize the exposure of products that can be easily scratched by adding protective covering or have the item crated. On bagged freight, for example: flour, rice, concrete; use cardboard on the sides prior to wrapping with shrink wrap to prevent bags from being torn. When shipping 55 gallon drums, secure drums to a pallet with suitable banding material. These are just a few safety tips for Guam shipping. By doing your part, you can help ensure your products will arrive safely to your destination and ultimately to your customer. At DGX we will always do our part as your Dependable partner!